305/305A Beaconsfield/ Chalfont Common - Gerrards Cross - Uxbridge ?? m High 1953-1958 1? 353 Amersham - Chesham - Ashley Green - Berkhamstead ?? m High ??? 0? Amersham was the first garage to receive RLHs, when RLHs 1 to 6 were delivered brand new there in 1950, replacing some lowbridge ST buses on route 336. When the second batch of RLHs were built in 1952, five were sent to Amersham, bringing the total to 11. This enabled RLH use on routes 305 and 359 (if required). On 9th May 1954, the type of tickets issued to passengers changed. Previously, pre-cut and pre-printed coloured tickets were punched in different positions to indicate their validity, by a small machine known as a 'bell punch'. Now, tickets were printed mechanically at the point of issue by a 'Gibson' machine, and torn off a paper roll. On May 18 1955, route 305 was extended to Uxbridge Station from its original terminus of Gerrards Cross, although the timetable was changed so that no additional buses were needed. The allocation of RLHs to Amersham changed somewhat erratically until late 1957, after which it stabilised at 6 vehicles (a graph of the allocation can be viewed here). In October 1958, route 359 was converted to one-person operation using one RF single decker, and route 305 was converted to RT operation, leaving only route 336 for RLHs. In 1961 the electrification of the Metropolitan railway was completed from Amersham to Rickmansworth, and as a result the 'Black Horse' bridge was widened and raised, giving a signed headroom of 14ft 3in. 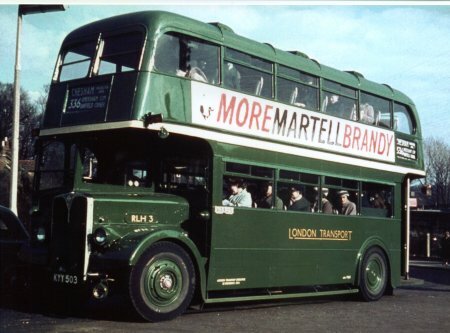 Although this was lower than the height of a standard highbridge double decker (RT), with dispensation the RT was allowed to pass underneath safely, meaning there was no longer a requirement for lowbridge buses. The RLHs were eventually replaced on route 336 by RF one person operated single deckers in October 1965; ending a tradition of lowbridge buses in the area which commenced in 1930. Amersham garage was demolished in the late 1990s when Tesco acquired the site. In October 2005, the 30th anniversary of the end of the RLHs at Amersham was commemorated by route recreations (as part of the annual Amersham and District Motor Society event- please see the home page for upcoming event details). Leavesden Road Garage closed in July 1952, and the route was diverted from Pond Cross Roads via the High Street to Watford High Street Garage instead (located at the far southern end of High Street). In October 1956, the route was diverted to serve the Metropolitan Line underground station, via Cassiobury Avenue. On 28/4/1958, Watford High Street garage closed, so route 336 reverted to its traditional terminus in Leavesden Road, via Watford Junction station and St. Albans Road. Some journeys continued North to Garston garage (RLHs were never allocated to Garston for service, but many were stored there out of service in later years). At some point between 1955 and 1962, the route started to visit Chorleywood Station, using a loop via Common Road and Green Street. Previously, buses used to go straight down the main road, the Gate pub being the closest point of approach to Chorleywood centre. From January 1958, some school 336 journeys were extended from Berkhamstead station over their pre-1936 route via Nashleigh Hill to Ashlyn's School. This this lasted until May 1964. From May 1964, one weekday bus per hour was diverted in Chesham to the Hilltop Estate.